Authorities are looking for a man who randomly shoved a 66-year-old woman to the pavement in Brooklyn earlier this week, leaving her with minor injuries. 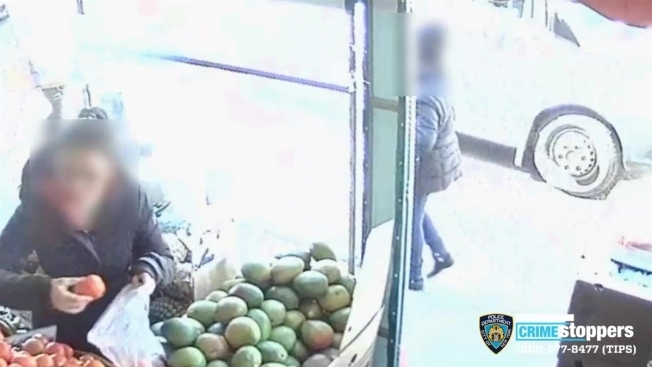 Cops say the woman was walking along Fifth Avenue in Sunset Park around 1 p.m. Tuesday when, without provocation, a stranger moved up from behind and shoved her to the ground. Surveillance video shows the two walking -- and the woman, stunned, suddenly flying off her feet. The suspect then rode off on a bicycle. He was last seen wearing a purple scarf around his head, authorities say. Anyone with information about the attack is asked to call 1-800-577-TIPS.